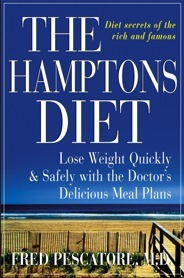 In my book, The Hamptons Diet, a New York Times best seller, I teach readers how they can still eat delicious foods and lose weight – while most importantly – maintaining this lifestyle change to carry on with them forever. Between serving as the associate medical director of the Atkins Center for five years and an additional 20 years of experience and research, I have helped thousands of patients lose weight – and keep it off for good! Unlike “fad diets,” for diabetes, the dietary approach we take is a lower carbohydrate, Mediterranean style dietary approach which has been scientifically proven to reduce blood sugar levels. Most of our patients who follow the protocol are able to dramatically reduce their medications and often times are able to eliminate their medications completely. As a recognized expert on cardiovascular disease, I have lectured around the world about healthfulness of a diet rich in omega fatty 9 acids and a decrease in simple carbohydrates, and the longer life expectancy this brings. Our workup includes all the cardiovascular risk markers, not just cholesterol. Reducing inflammatory markers, maintaining optimal blood sugar, Insulin, and Vitamin D levels are just as important as having a normal blood pressure. With a few lifestyle changes, we can teach you how to prevent heart disease.